The sun is just a memory… the planets are all gone… mankind is on the brink of extinction. Earth has been destroyed, the entire solar system turned to dust by a cataclysmic event known as the Fracture. Now, the last survivors of humanity live on vast arkships drifting through the Cluster, fighting for survival in this hostile, ever-changing environment. When the arkship Obsidian is attacked, Wynn awakes in an escape pod fleeing from a huge space battle, unable to remember who he is. Aided by Bara, an engineer who survived the attack, Wynn finds himself hunted by a killer robot, the forces of a rival arkship, and the mysterious Church of the Infinite. Can Wynn survive long enough to unlock his lost memories, discover his true identity and take his revenge? 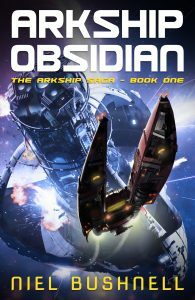 Arkship Obsidian is the first book in an epic new sci-fi series. If you liked Battlestar Galactica, Isaac Asimov’s Foundation series or The Expanse then you’ll love this page-turning saga from award-winning author Niel Bushnell. Buy Arkship Obsidian to discover this exciting new series today! Sign up to my newsletter to find out more!